These herbed buttermilk biscuits are a great twist on your typical biscuit. Flaky, buttery layers with fresh herbs thrown in to break up the richness. You guys know Nikki? She writes the blog Seeded at the Table. I just adore Nikki, so when I heard some of her blogging buddies were going to throw her a virtual baby shower, I of course said, “Count me in!” It’s party-central around here lately. Nikki is having a sweet baby boy–her second! Nikki is originally from Michigan, very close to where I grew up, actually. These days she is living in Mississippi with her family. So to celebrate this sweet southern boy, we’re throwing her a southern-themed shower. Nikki is having a boy — boys need food like this. Nikki is pregnant — pregnant ladies need food like this. So I don’t see an issue with this not being a cute little calorie-free bite that you can pop in your mouth. These buttermilk biscuits are far from calorie-free but pregnancy is the time to indulge. 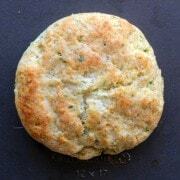 I threw in the herbs to give the biscuits a little freshness and color. Apparently I’m on a green kick this week. The great thing about these is that you could substitute different herbs if you don’t have parsley and chives on hand. Or you can add herbs that will compliment the meal you are serving these with. These were great with beef stew and were also terrific with some eggs at breakfast. And they would be great for a baby shower. Really! Especially a southern baby shower. So Nikki. Let’s talk for a minute. You’re about to have two kids. I’m obviously an expert on that topic. Oh wait, no…I’m not. I still don’t have a clue what I’m doing. But honestly, you’re going to do great. I just know you’re going to handle it with a smile on your face just like I’ve seen you do with everything else. Number one tip? Enjoy the baby snuggles–mine are already starting to get more scarce. Time goes too fast. PS: Whip up a batch of beef stew seasoning mix and homemade beef stew — you won’t be sorry! This buttermilk biscuits are the perfect complement to stew. PPS: I have these biscuit cutters and I LOVE them! You could even use them to make mini biscuits that would be a dorable for a shower or parties. Or calories control, ha! In a food processor, combine flour, baking powder, baking soda, salt and herbs. Pulse 2-3 times to combine. Scatter butter over dry ingredients and pulse 5-6 times or until the mixture looks like coarse meal. Do not overmix. Add the buttermilk and again pulse until it just begins to come together. 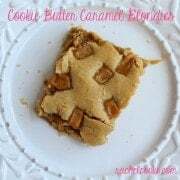 Dump dough onto a lightly floured surface and shape into a large rectangle approximately 3/4-inch thick. 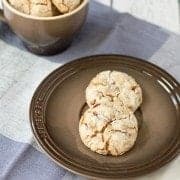 Using a 3-inch round cutter, cut out biscuits and place onto a parchment paper-lined baking sheet. Press together scraps of dough and continue cutting out rounds until all the dough is used up. Don’t mess with the dough too much, work quickly as you don’t want to warm it up too much. Bake for 12 to 15 minutes or until golden brown. Brush tops with melted butter. Verdict: Buttery and rich but with the fresh taste of herbs to cut through and add a little life. Perfect! Husband’s take: Umm..he was a major fan of these. What man wouldn’t be? 2-year-old’s take: She inhaled these. Changes I would make: None are necessary, but you could add in different herb, some cheddar, some cracked black pepper–whatever! Have fun with them. 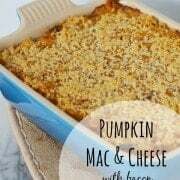 Check out this roundup and this one too, for more southern-inspired recipes! Awww so fun, love that you guys threw a shower for Nikki! She’s such a sweetheart :) Your biscuits are the perfect choice for a southern shower! Even if you admit you don’t know much about the South, you definitely hit it spot on with these biscuits! 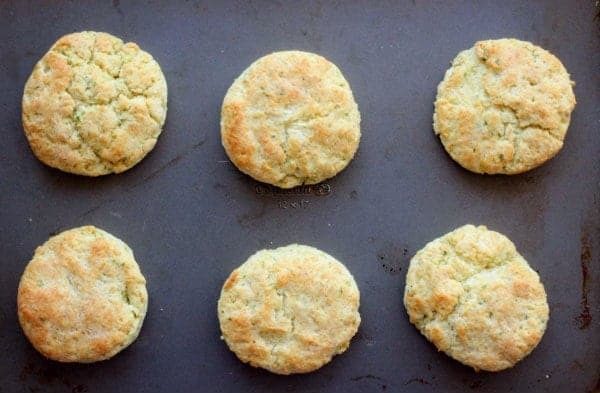 I’m a biscuit lover and I love the idea of adding herbs, you know, to make them healthier! ;) Thank you for contributing to my shower, Rachel! You are one of the sweetest, most thoughtful bloggers I know. And, I will be coming to you for advice on raising TWO kids, because whether you see it or not, you are doing a GREAT job of it! These sound so simple! I’m one of those crazy biscuit people who can eat 4 in a sitting… well anything bread, actually. I love that you used fresh herbs too! Fluffy, warm biscuits are just life’s comfort food. Congrats to your friend! Nothing beats buttermilk biscuits. What a great tribute to Nikki! Not pregnant ladies need this too! This looks so good! Awww I love these virtual baby showers and I am so excited for Nikki! 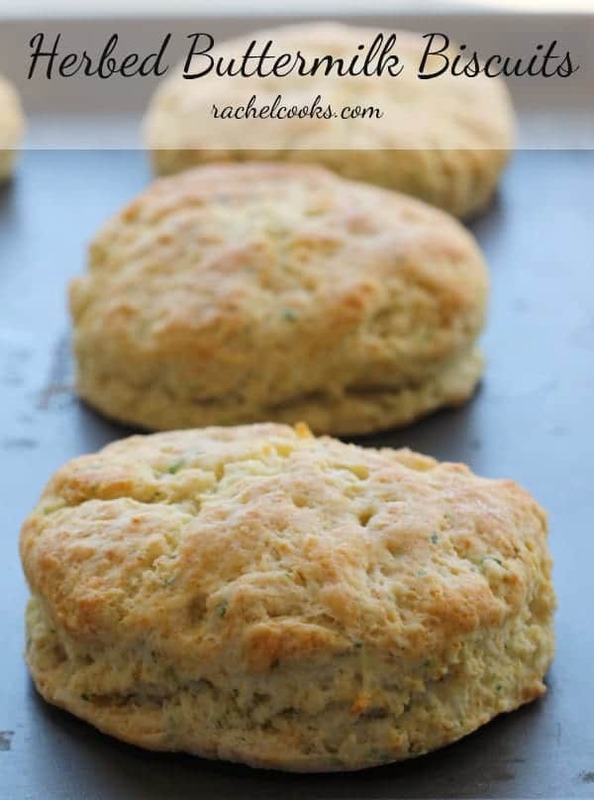 These biscuits are gooorgeous and I love herbs! Great minds must think alike – we both make buttermilk biscuits!! I love the idea of adding herbs. Yummy! For not being from the South I think you did an awesome job of going straight to the heart of Southern food! Love these biscuits. Thanks for joining in ! Pies and biscuits I survived on them growing up! Your biscuits look amazing! These biscuits look so good! Rachel, these look amazing. I bet they’d make one heck of a breakfast sandwich…if I could manage to have any leftovers! Thank you so much for joining us for Nikki’s shower! You hit the nail on the spot, every pregnant lady needs food like this! 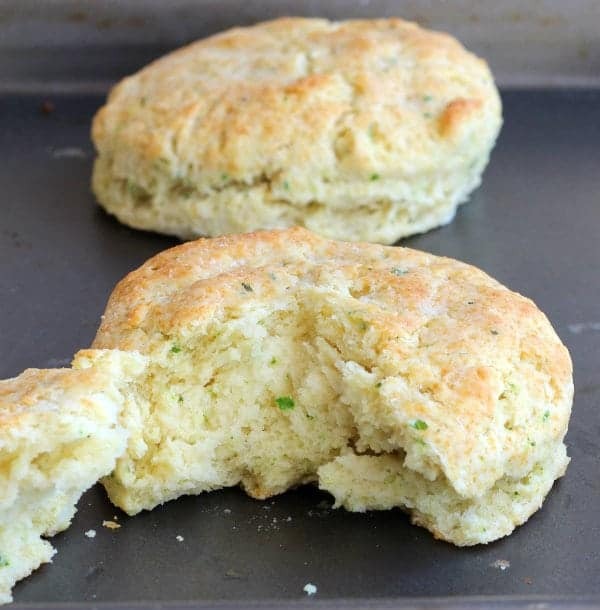 What a winner with these herbed buttermilk biscuits, carbs are a pregnant lady’s best friend! YUM! So imagining slathering these bad boys with butter… omg. They look so fluffy, Rachel! Somebody pass me the butter please?! I can just smell these baking! Hi Rachel, I think these biscuits look absolutely cute and delicious! I lover the specks of green in them! I’m so surprised that no one suggested add some “sweet-milk gravy”. I wonder if you could make gravy with butter milk ?